Abercrombie & Fitch reported Friday a steeper-than-expected drop in quarterly comparable sales, in part because of inventory shortages, and the teen clothing retailer's shares fell more than 11 percent. Sales at stores open at least a year combined with online sales fell 15 percent. The decline was most pronounced at the Hollister chain, the company's largest. But Abercrombie lost business under all its banners, even in its direct-to-consumer operations, which include e-commerce. 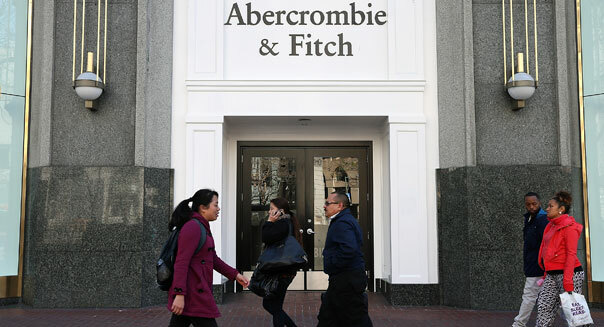 Abercrombie & Fitch Co. (ANF) said it expected comparable sales to be slightly down for the remainder of the year. Overall sales fell 9 percent to $838.8 million in the first quarter ended May 4, well below analyst expectations of $941.3 million, according to Thomson Reuters I/B/E/S. The company said it had more merchandise shortages than expected during the quarter, but Chief Executive Officer Mike Jeffries said in a statement that the issue was "largely" resolved. Abercrombie joins rivals American Eagle Outfitters Inc. (AEO) and Aeropostale Inc. (ARO) among chains that cater to young shoppers and reported poor first-quarter results this week. Comparable sales, comprised of same-store sales and online sales, fell 18 percent at Hollister, and 13 percent at the company's namesake chain. Abercrombie got some relief from a jump in sales outside the United States. The company said its loss narrowed to $7.2 million, or 9 cents a share, in the quarter from $21.3 million, or 25 cents a share, a year earlier. That was 4 cents worse than analysts expected. Shares of Abercrombie were down 11.2 percent at $$48.26 in trading before the market opened. Target (TGT) was the second most-visited discount retailer in the U.S. during March, behind only Walmart. One reason was the number of Target stores. The company has been attempting to take on Walmart by adding grocery sections to more stores, and by offering groceries at competitive prices. This has helped Target maintain strong financial performance despite the weak economy and its additional spending on its launch in Canada. Most Americans surveyed by the American Customer Satisfaction Index rated Target well: It finished in a three-way tie for second place in the department and discount store category, behind Nordstrom. As recently as 2011, Taco Bell (YUM) was struggling to keep competitor Chipotle (CMG) from taking its customers, with flat or negative same-store sales growth in each quarter that year. This changed in early 2012, when Taco Bell released the Doritos Locos taco, a hard taco with the flavor of Doritos nacho chips. That item help the company increase comparable sales in every quarter of 2012, as the company sold more than 1 million of them a day. In March, Taco Bell CEO Greg Creed told The Daily Beast the company had hired 15,000 workers just to meet demand for the Doritos Locos taco in 2012. Last year, the company's sales increased by $1 billion to $11.8 billion, and net income rose by roughly $300 million to $1.6 billion. CVS (CVS) is the top provider of prescriptions in the country, filling or managing more than 1 billion prescriptions a year. It has operates in 45 states, and 75% of the people in the markets it serves live within three miles one of the company's 7,400 retail stores. Last year, CVS estimated it gained millions of new customers following a dispute between Walgreens (WAG) and Express Scripts (ESRX), the prescription management service. Even after the dispute was resolved, CVS was able to retain many customers who used to fill prescriptions at Walgreens. In the first quarter of 2013, the company's revenue grew 5%, as same-store sales grew 4%. Despite CVS's gains, Walgreens is still the most visited drugstore in the country. According to RetailSails, the company has the most stores, at 7,890, and the largest average store, at 14,400 square feet, among all drugstore chains. The company's tenure in first place may not last, however, thanks to that now-resolved dispute with Express Scripts. The company spent nearly nine months without using Express Scripts, the largest prescription management service in the country, losing an estimated 60 million prescriptions to rivals. CVS estimates that it will retain roughly half of the Walgreen's customers it gained as a result of the squabble. In 2011, Wendy's (WEN) overall sales surpassed Burger King's, making it the second-largest burger chain in the U.S. But Wendy's growth has actually been quite modest as of late, with same-store sales in North America growing just 1.6% from 2011 to 2012. (In fact, Wendy's first-quarter profit just tumbled 83%.) Wendy's is in the process of remodeling many of its restaurants with more comfortable seating arrangements and flat-screen televisions. However, not all of its stores are getting upgraded. The company announced in March it was going to shutter as many as 130 underperforming stores. Last year, the company also made significant changes in its marketing strategy and menu in order to attract customers who have been lured in by chains such as Panera, which promotes healthier food at slightly higher prices. There is a reason Starbucks (SBUX) is No. 1 in the coffee category: Sales in the U.S. grew by nearly 346% between 2001 and 2012, and the number of stores grew by 195%. The company has struggled in the U.S. in the past several years, but its stock has continued to rise as global sales have helped to pick up the slack. Worldwide, Starbucks revenue grew by 7% in 2012 compared to 2011. This included a 15% growth in the Asia/Pacific region. In its early years, the company did not place much emphasis on its food items. However, that has changed in recent years, especially following the purchase of Bay Area pastry chain La Boulangerie. However, some industry analysts remain skeptical of Starbucks' ability to compete for customers' breakfast purchases. The last decade or so has been especially tumultuous for Burger King: It was taken private in two separate instances, in 2002 and in 2010, and became a public company again last June. The company hasn't performed well in years, with an average growth rate of -0.1% between 2001 and 2013, which allowed Wendy's to take its No. 2 burger chain title. A restructuring that began after the second buyout in 2010, in which many stores were sold to franchisees, has cut deeply into the company's sales. But not all news for Burger King is bad news: Nearly one quarter of Americans visited a Burger King in March. Between 2001 and 2012, Subway's sales in the U.S. grew nearly 169%, while the number of stores grew nearly 93%. Subway is by far the largest fast food chain in the U.S., with almost 26,000 restaurants. The company has been able to fuel its large growth through both international expansion and a domestic focus on healthy eating, most notably using ads featuring Jared Fogle -- a man who lost an impressive amount of weight while regularly eating the company's sandwiches. In 2013, for the ninth year in a row, Subway received the highest score in the country in a Harris Poll EquiTrend study in the "quick service restaurants" category and was named brand of the year by that group. Walmart (WMT) is by far the largest retailer in the U.S. and in many parts of the world. It was recently ranked No. 1 in the Fortune 500 after it reported more than $469 billion in worldwide revenue in 2012. While international markets are critical to growth, the U.S. market provides the majority of its revenue: U.S. sales comprise 62% of the company's sales. In the last five years, Walmart has added 450 U.S. stores, a 13% increase overall. However, according to Bloomberg, the company's U.S. workforce has dropped 1.4% in that time frame, leading customers to complain about a lack of inventory and longer check-out lines -- and to defect to rivals such as Target and Costco. In February, the American Customer Service Index ranked Walmart the lowest of all discount retailers, the sixth year in a row the chain has held or tied for the last place spot. Almost half of all Americans visited a McDonald's (MCD) in March, but, U.S. sales of $8.8 billion weren't even the company's largest revenue segment last year. Rather it was the company's sales in Europe of $10.8 billion. According to Technomic, McDonald's same-store sales grew at an annualized rate of nearly 5% from 2001 through 2012. However, this has slowed recently: The company's systemwide sales in the United States rose by just 0.3% from the year before in the final quarter of 2012. The company is already so large that its bottom line is deeply linked to global economic conditions, leaving it unable to raise prices for now. In order to boost sales, McDonald's CEO Bob Thompson told CNBC the company may try allowing U.S. stores to serve breakfast all day.